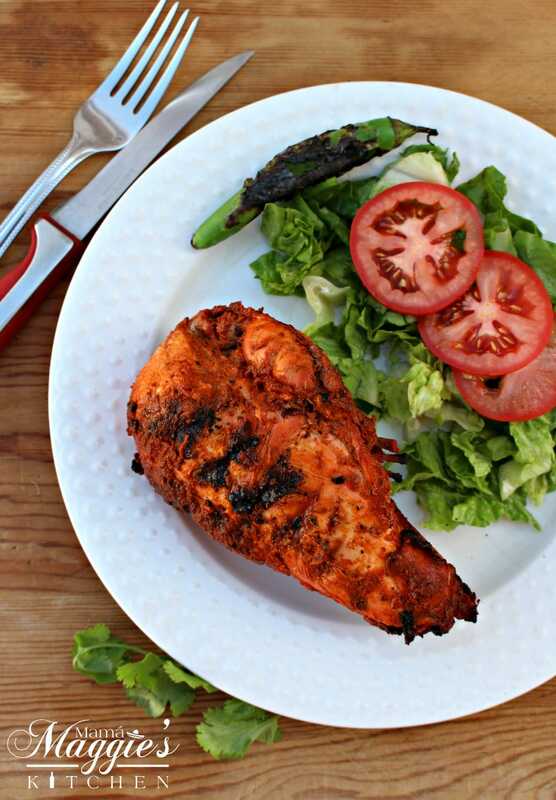 Pollo Adobado, or Mexican Chicken Adobo, is a savory and tasty dish. It marinates for hours to create a delicious and robust flavor. 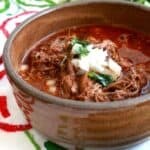 Watch the video or follow the step-by-step photos below to recreate this traditional Mexican recipe. Usually at taco stands, you see a big, vertical spit turning and roasting. Guys in machetes shaving off meat for your taco. Those are Tacos Al Pastor and made with pork. 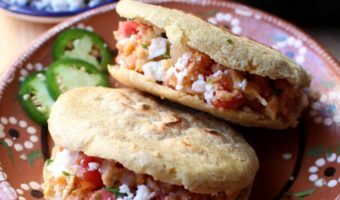 Since my readers have been asking for more chicken recipes, I decided to maket his taco stand favorite but with chicken. Pollo Adobado Mexicano, or Mexican Chicken Adobo, is on the menu today! It all starts with the sauce. It’s boss! 😉 Start by roasting the onion and garlic. 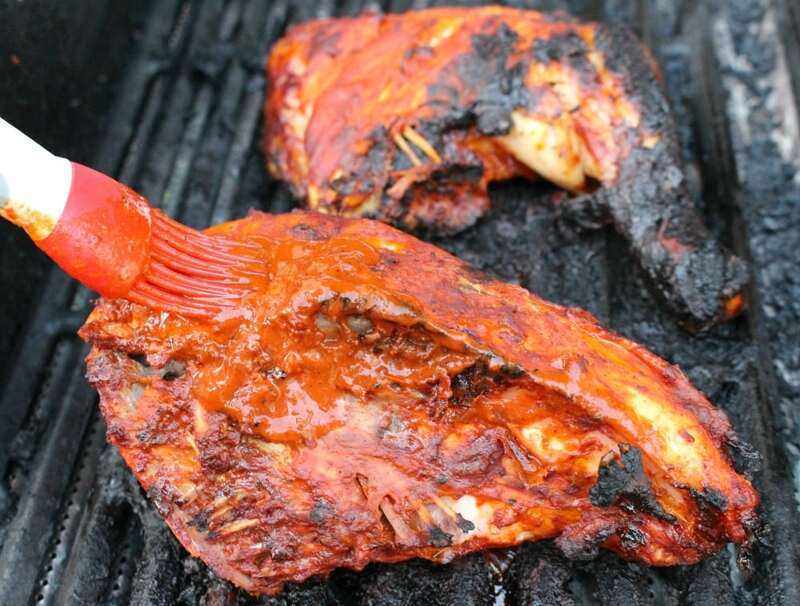 You want it nice and charred. Black is right, in this case. 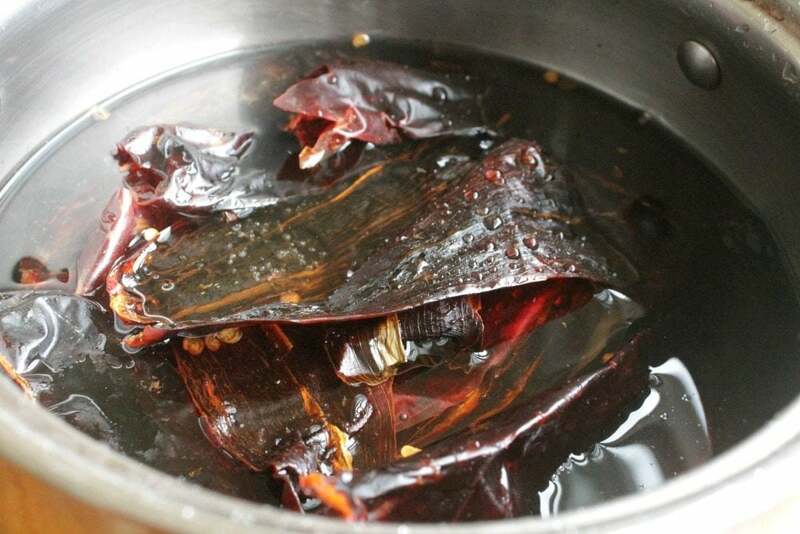 Rehydrate the chiles by placing them in warm water. Or place them in a saucepan, add water and chiles, and bring it up to boil. Then turn off the heat. Give them 5-10 minutes before removing. They should be pliable. 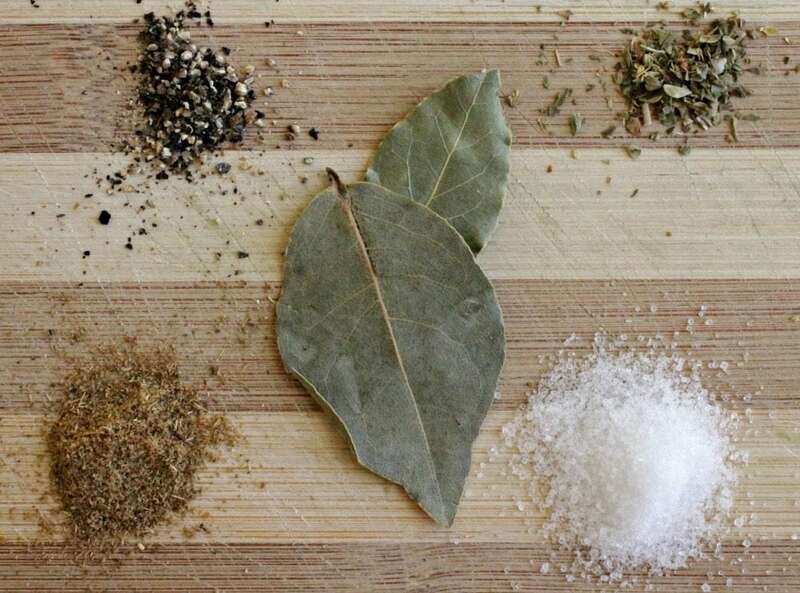 Salt, pepper, oregano, cumin, and bay leaves all go into the blender. 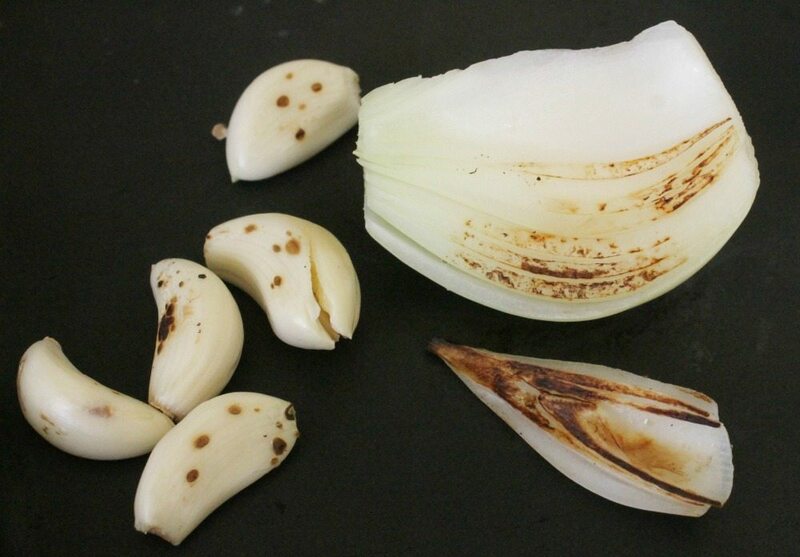 These ingredients give the adobo sauce good flavor. 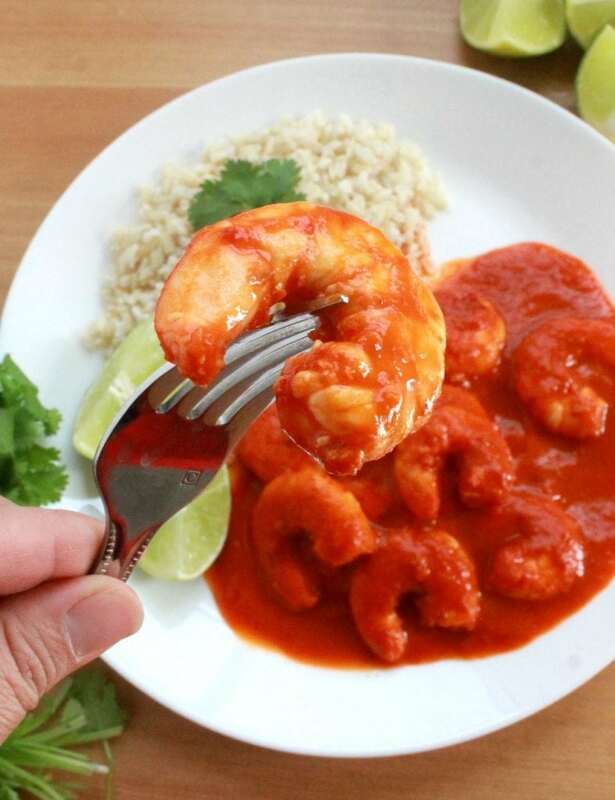 Achiote paste. 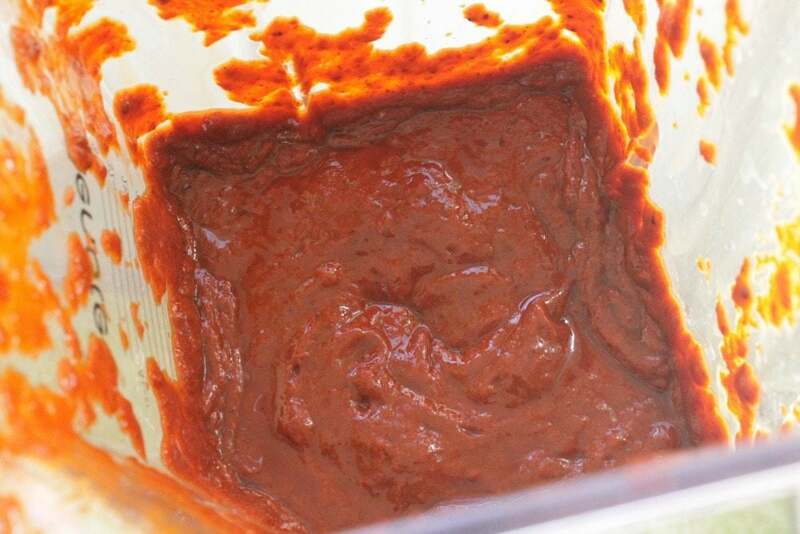 Whenever you hear “adobo sauce,” achiote paste has been used. 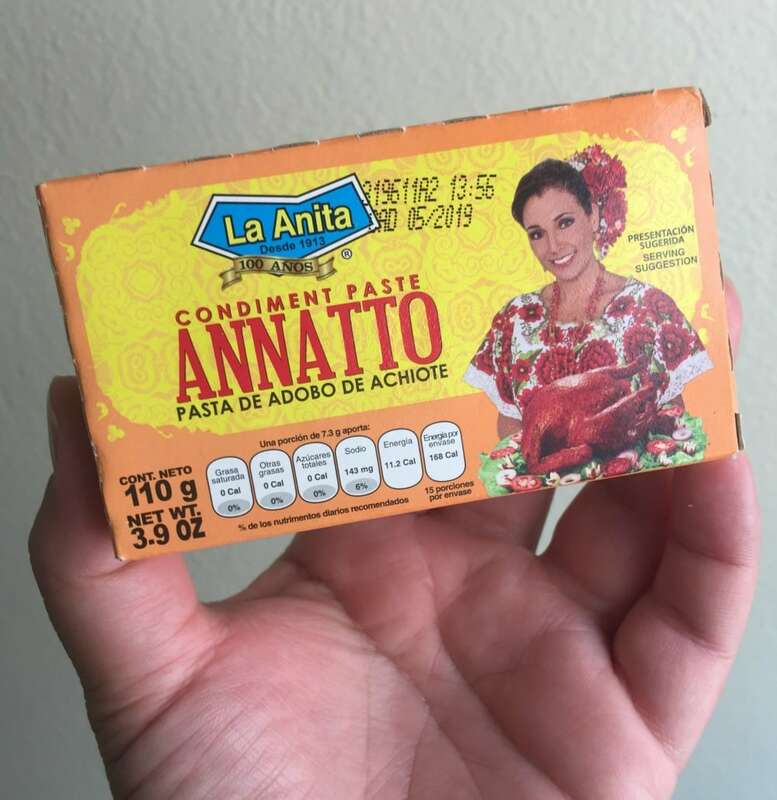 I sometimes have a hard time finding it north of the border, but if you have annatto seeds, you can make your own achiote paste. This stuff can stain your fingers. Use a fork or a spoon when handling. Blend until smooth. Wish you could smell this adobo sauce. There are some deep, robust, and slight tangy flavors in here. My Pollo Adobado is going to Mmm Mmm good! What we have here is a whole chicken cut up. 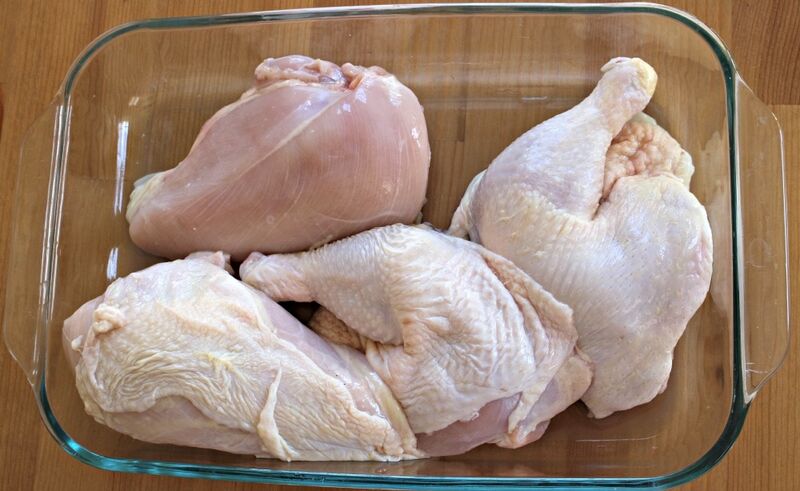 I rinse the chicken and pat it dry before placing in the Pyrex plate. 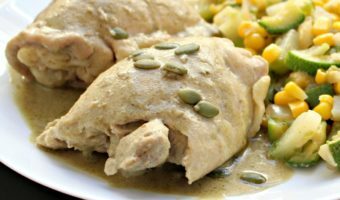 You can also use just breast chicken meat or just thighs. Whatever cut of chicken you like is fine. 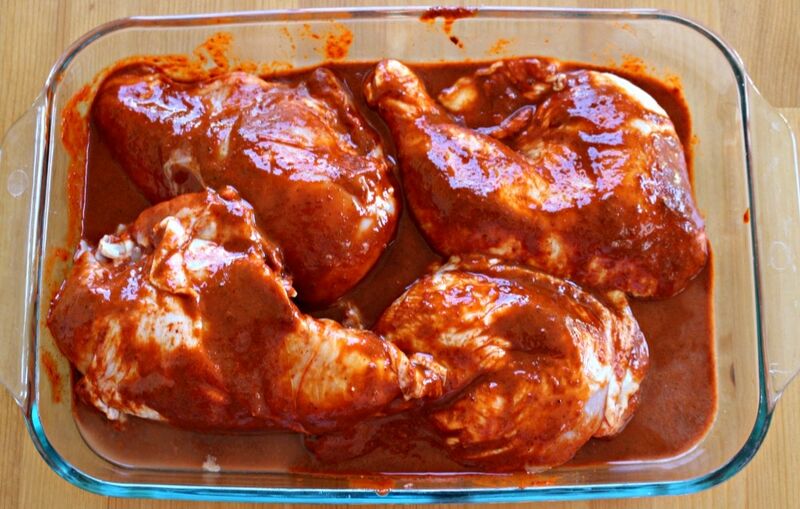 You have to let the chicken marinade for a minimum of 4 hours in the refrigerator. Preferable, overnight is best to really the get the adobo flavors in there. Sometimes, I’ll even poke the chicken with a fork. This is so the sauce and go inside as well. Take this to the grill. 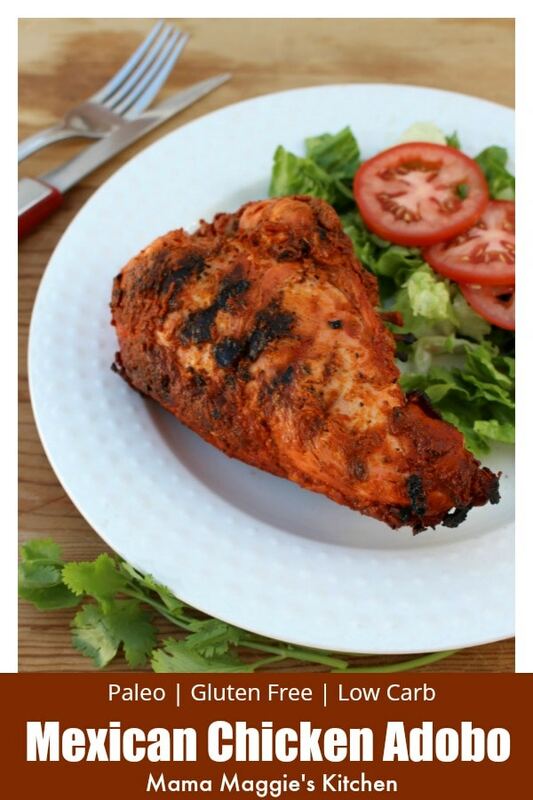 Or, if it’s not grilling season, you can place the entire Pyrex dish in the oven and bake until the chicken is done. 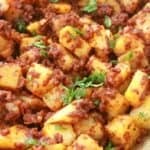 If you are baking the Pollo Adobado, add some diced potatoes. Dinner in one pan. Who doesn’t like that?! For me, though, I love grilling! Just look at those grill marks. Makes a girl drool! I love the taste of charred chicken. 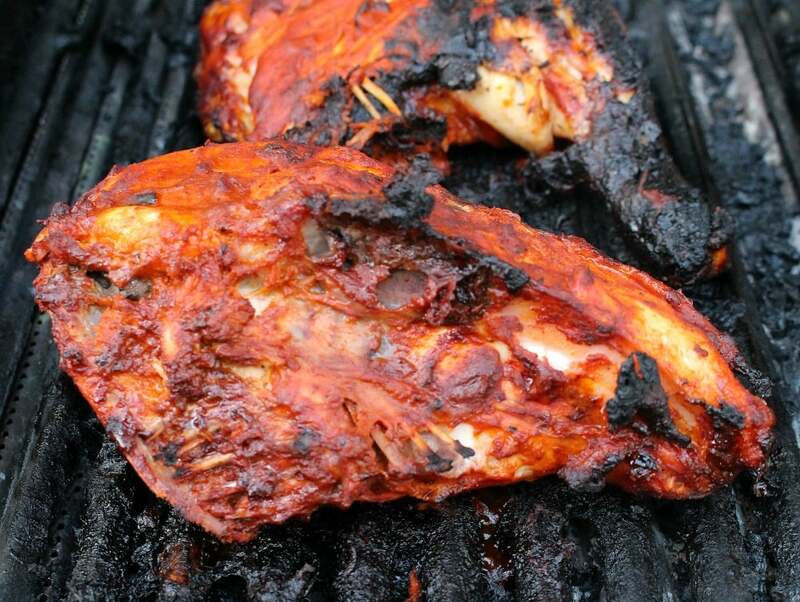 Each time you turn the chicken, baste the Pollo Adobado with more of sauce. We’re creating layers of flavor. Serve your Pollo Adobado, or Mexican Chicken Adobo, with extra sauce and potatoes. Potatoes and the adobo sauce go together perfectly. 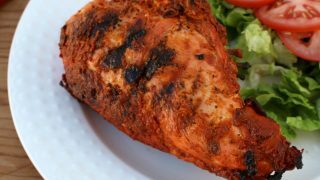 For those of you looking for a carb-friendly, diabetic meal, serve this with a simple green salad as I’ve done here and enjoy! Add the guajillo chiles and ancho chiles to the sauce pan. Let sit for 5 minutes, or until chile is soft and pliable. Meanwhile, char the garlic and onion. (This will only take 1-2 minutes). To a blender, add the charred garlic, onion, chipotle, bay leaves, pepper, oregano, cumin, cinnamon, cloves, apple cider vinegar, water, achiote paste, salt, pineapple juice, and reconstituted chile. Chop up the chicken and rinse. Pat dry and place in a large Pyrex plate. Pour the adobo sauce all over the chicken. With your tongs, turn the chicken to coat with the adobo sauce. Cover the chicken with plastic wrap. Marinade in the refrigerator for 4 hours, preferably overnight. After 15 minutes, turn the chicken. Cook again for 15 minutes, and baste with adobo sauce. The chicken is ready when it reaches 165 F (74 C). 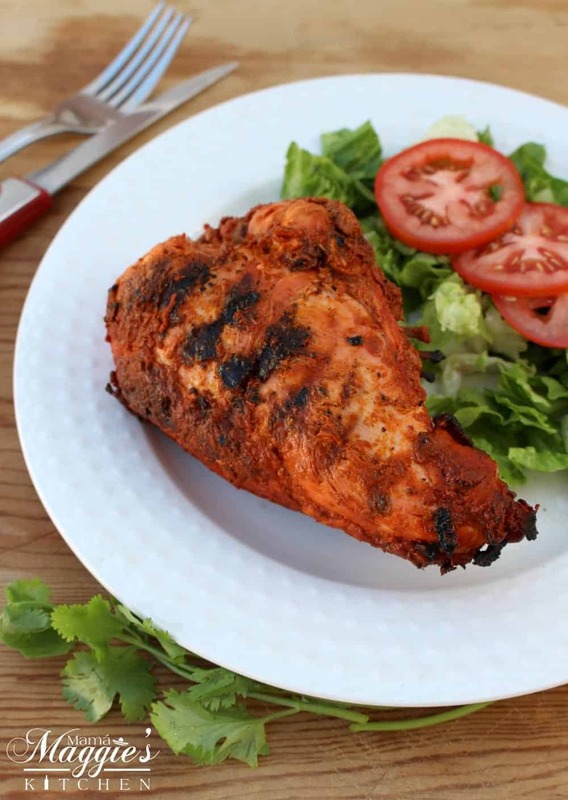 You can also bake the chicken at 375 degrees for 50 minutes, or until the chicken is fully cooked. Oh boy! I can’t wait to try this recipe for our family gathering this weekend. I have all the ingredients and ready to tackle. This looks so juicy and satisfying! I love to grill too; I’ll have to have my husband make this for me this weekend! I heard so much about Adobado chicken but never tried it. This is so easy to make. Thank you so much. That dish really sounds like a flavorful and tasty chicken. We also have our version of pork and chicken adobo in our country. This photos makes me really hungry haha. Yum!! 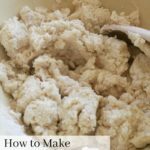 Your recipe makes me want to try it! Loved your pictures and clear instructions along the way. Pinning! This is my favorite Mexican dish. I also have my own version. I am so excited to try your recipe. 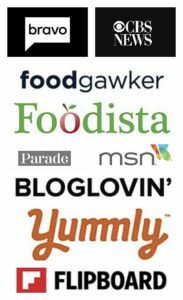 I am always looking for a new recipe to try. It looks simple yet delicious. Oh this looks absolutely delicious and I am loving all the flavors of this meal. Definitely a dish I know I would love! OMG, I bet this is so savoury. It’s seasoned so well and properly. Totally trying this, thanks so much!